What is cyber bullying? By actual definition, cyber bullying is an online action that is performed with the intent to cause harm to another or to their reputation. Typically, the term is concerned with the welfare of children, who can be terrorized by use of the Internet and electronic devices like cell phones. Offline, in schoolyards and on neighborhood street corners, the bullying of children is an age-old problem. Chances are, a measurable percentage of visitors to this page will have had their own encounter with a childhood bully. That means, most people know what a bully is from personal experience or observation. Offline, a bully will harass, ridicule and humiliate others. They often gang up on their victims when there are no witnesses or sources of aid available. In adulthood, bully behavior can perpetuate in modified forms such as membership in oppressive street gangs, abusive relationships and all too often, as work place harassment. Cyberspace is a different realm and unfortunately, worse than its offline counterpart. Without a physical presence, deception is easy and accountability can drop to nonexistence. Through anonymous postings or imaginary screen names, a cyber bully can wreak more damage than ever before. Through online chat rooms or forums, email and cell phones, the cyber bully penetrates the traditional brick and mortar walls of defense and can relentlessly push his bullying tactics into the face of his victims. When pondering the question, "What is cyber bullying?," there are important factors to consider. Offline, a bully only has a local reach, even though that alone can be devastating. School kids might be able to recite the names of their own class bullies without hesitation, as bullies are usually obnoxiously notorious among classmates. But cyber bullies can hide and have a much wider domain than offline bullies. Search engines like Google actually give cyber bullies an unfair advantage over Internet novices. Algorithms are gamed and techologies like PageRank are abused to suit the whims of the vindictive. And when cyber bullies spread rumors and do their mudslinging, Google actually gives those pages popularity brownie points. 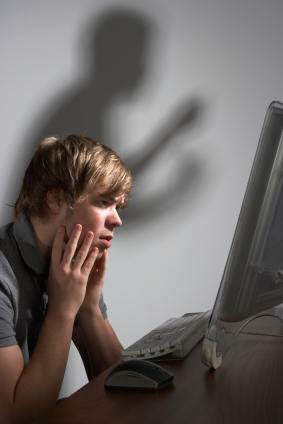 Cyber bullies use techniques like googlebombing, trolling and flame-baiting to ambush unsuspecting Internet users. Through these tactics, novices are caught off guard and innocent remarks or comments get twisted out of context and used against them. These errors are often fodder for flame wars, riling up crowds who in turn willfully participate in viral attacks against the victim. The Internet is a world wherein few laws exist, yet specific rights are upheld as sacred. Freedom of speech is one of those sacred rights. Offline, the right to safety and reputation is a given. But online, freedom of speech overrides safety, reputation and other liberties to the point that it is the only "right" that matters. When determining what is cyber bullying and what is not, realize that claims of free speech are exclaimed loudest by those who work hardest at damaging others. Such a hypocritical stance is, in essence, a way for cyber bullies to deflect scrutiny and avoid detection for their harmful intentions. If nothing else, it is the perfect justification that happens to work quite well on the general population who don't take the time to take a closer look. Now that you've read the "What is cyber bullying" page, let us take a look at how cyber bullies have turned their tactics into a marketing plan.